Stands 4 1/4" tall, 2 3/4" x 2 3/4" wide. Heavy piece. Nice clear crystal with no water stains. What is shown in pictures is exactly what you will receive. NO EXCEPTIONS. 8” Vintage Crystal Vase with Frosted And Clear Flowers Heavy 4 Lbs French ? LA MAISON France French Large CRYSTAL FOOTED VASE 9.5"
La Maison Crystal Footed Vase. Vase is 9.5" tall. Do you live in the greater Chattanooga area?. International Patrons. French vintage crystal amethyst purple hand painted gold rim enamel vase 5.5". Signed '78'. No chips or cracks, excellent condition. Shipped with USPS Priority Mail. Gold accent. • Production Dates: Not Known. Just beautiful crystal vase from Royales De Champagne French art glass in a fan shape. Great gift idea. Authentic French Baccarat Crystal Art Orgue Spiral Flower Vase in Red Box 8"
Authentic Baccarat Crystal Vase Art Orgue Spiral Flower Bud Vase Original Signature Red Box with booklet Vase size: 8"h, 2" diameter Made in France Condition: Previously owned, this beautiful crystal vase appears unused. Original Red Box in good condition, with clear tape remnants on ends and corners show wear from storage. Please see pictures showing item details and condition., . Another beauty from my Uncle's collection, this Cofrac Art Verrier France Crystal Vase adds a touch of class to any room in your house. It boasts a very modern design and is perfect for those who love the mid century look. Tiny 'FRANCE' embossed on the underside. It’s a round millefiori crystal vase, with a short neck, beautifully etched with flowers. This is a piece I couldn’t resist! I bought it roughly 13 years ago, in the early 2000s. The base is in the style of the current Saint-Louis vase, Botticelli. BEAUTIFUL HEAVY CRYSTA L/GLASS VASE. HEAVY, RICH LOOK, WOULD MAKE A GREAT ADDITION TO ANY TABLE/CURIO. Excellent condition with a few surface scratches. Here is a beautifulLead Crystal Vase made in France 5" tall and in excellent condition, ready to showcase your spring flowers. SIGNED BACCARAT. MAGNIFICENT FRENCH CRYSTAL VASE. BACCARAT CRYSTAL, DOUBLE MARKED. ROSE BUD VASE. De verzending gebeurt normalerwijze binnen de 2 werkdagen. Votre numéro de TVA, etc. Votre numéro de TVA, etc. included in the list are the photo's as shown and the specifications as listed. EJ (juni2018). 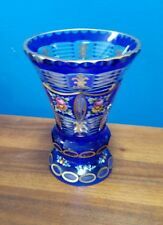 Crystal Vase Blue Colour French Gold 8085 Spanish Handmade in Spain New.